Mirroring digital culture developments in society at large, museums are increasingly incorporating social media platforms and formats into their communication practices. More than merely providing additional channels of communication, this development is invested with an understanding of social media as integral to the ongoing democra- tisation of the museum. The confluences of new media affordances with New Muse- ology objectives along with the underpinnings of the aforementioned understanding is discussed in this article. The article will argue that development in this area is not only driven by solid results and public demand but also by collective assumptions and associations as well as by a political need for institutions to justify their relevance in society. In conclusion, the article suggests that, while the integration of social media communication may serve to market the museum as inclusive, it may also simply pay lip service to genuine civic engagement and democratic exchanges with the public. This week, I’m in Fort Worth, Texas, for iConference13, a conference on library and information science. One of my missions has been to get a clearer idea of what this whole LIS (as it’s known in the parlance) thing and being an iSchool is about. Actually, we’re quite a large group coming from my institution, as RSLIS will be taking part in arranging next year’s conference in Berlin, and yes, going west with my lovely colleagues has been a large part of the experience as well. But the conference has also been very informative, and given me a better insight into the breadth and kinds of topics examined in an information science perspective, and into the methods used and approaches taken. Still, I have to admit that I feel a little more like a fish out of water here compared to my experience at Museums and the Web a couple of years ago. So while I’m starting to see how my research may relate to a wider understanding of information science, as embraced by RSLIS if not so pronounced in this conference, it’s still not my home turf. And maybe it doesn’t have to be. Today’s session of choice was focused on theoretical frameworks and the social context of information, as presented by a panel of early career scholars. Thursday morning, I joined a very interesting roundtable session, where 3 scholars received critique on second draft papers. For an academia rookie like me, this was a very interesting introduction to the peer review process and how editing decisions may inform research development. Plus the papers submitted by Mette Skov and Dorte Madsen sounded very interesting, so I will look forward to reading them in full. Wednesday, seeing my supervisor Lennart Björneborn present his and Toine Bogers’ research on experiences of serendipity as shared on Twitter was a pleasure, not only for the interesting perspectives in the research, but also for their relaxed presentation style and well structured ppt. (So, thumbs up, Lennart, I know that you will be reading this!) And Tuesday’s workshop on Digital Youth in led to some meaty discussions about how to involve the young people we are trying to understand in the upcoming summit and whether we really know what we are doing? But the session that has most reverberated with me was the alternative event hosted by Theresa D. Anderson, Leanne Bowler, Lisa Nathan & Eileen Trauth. Buildig on Anderson’s ‘4 P heutistic’, the session centered on a discussion of creative information practices, and how to use and understand them in a scholarly research context. 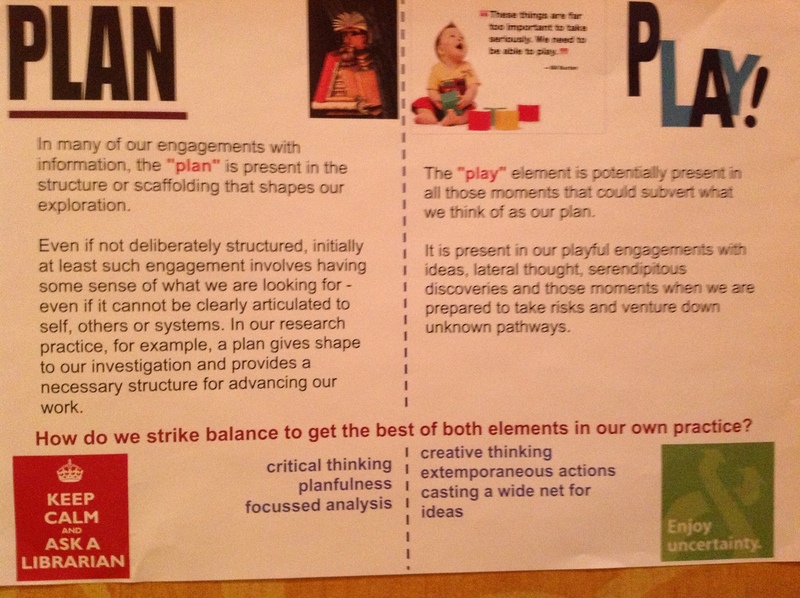 For me, this is a confirmation of the approach I am already using, as my research to date has been very much about playing around, trying to get an understanding of my field and the possibilities and problems in it not through a thoroughly structured study, but by exploring many facets and engaging in all sorts of activities. Now this research will not translate into solid data, but it still very much deepens and informs my understanding, which I believe is crucial, even if it still leaves my with a challenge in constructing and describing a solid empirical ground for my research. It will come. And my hope is that perhaps I can use studies and frameworks such as Anderson’s to describe and validate what I’m doing. And remind me to savour the pauses too! 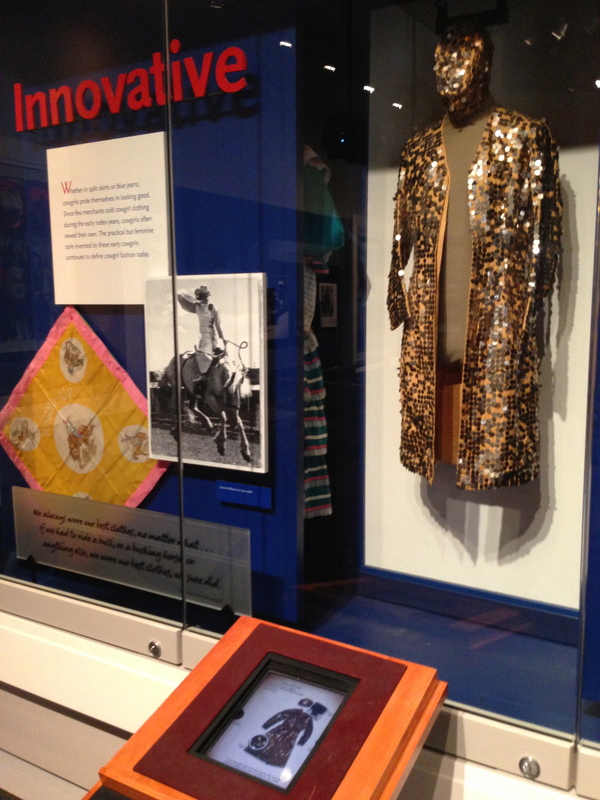 So, for me, my visit to The National Cowgirl Museum and Hall of Fame here in Fort Worth was also part of my research. And good fun too, even if it didn’t quite live up to my high expectations, kinda kitchy, kinda quaint. What was interesting about the museum, apart from the cowgirl glamour, was that it had quite a lot of interactive exhibits. In the country music section, for instance, little diner jukebox setups allowed you to listen to a short presentation of and a track by some of the greatest female country singers (so to get into that cowgirl spirit, here’s a little Patsy Cline gem for y’all). And in a display of cowgirl outfits, you could get the actual exhibit to change by swiping a touch screen. And then, of course, there was the bronc ride. 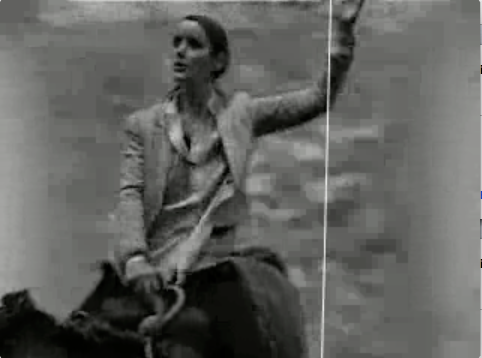 A silly affair, but sweet, where you could have a little video done of yourself as a rodeo rider, mixed in with some vintage film clips which you could then download from the website. Not sure if it really gave me a deeper understanding of the cowgirl spirit (overall, the experience was more hall of fame than museum, as the history of the women of the wild west was not explored in much detail), but it was fun and made for a nice souvenir. Finally, as part of a wonderful special exhibition of maverick quilts, a participatory quilt project invited contributions from visitors, a participatory museum quilting bee, if you like. 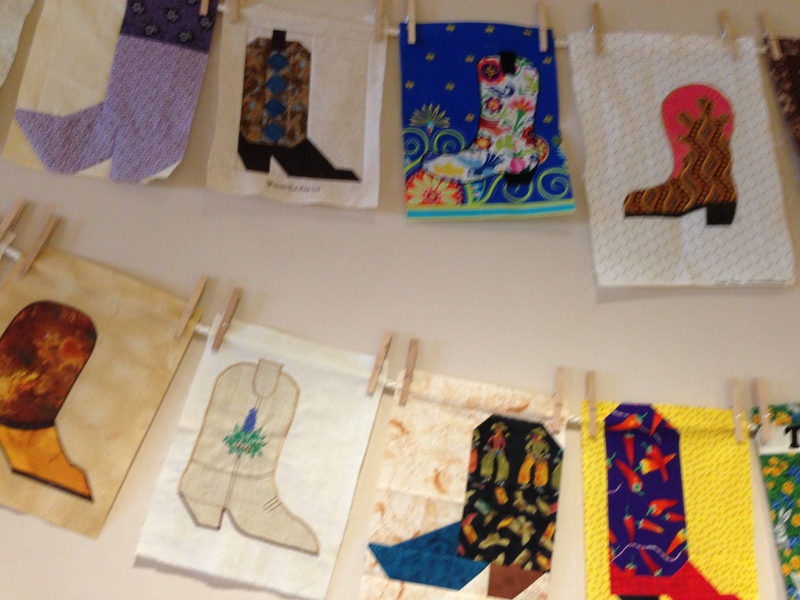 Somewhat short of the craft and creativity of the quilts in the exhibition, it was still nice to see that the community had indeed engaged in this activity and submitted patches under the western boot theme. Another bit of extracurricular research was the ‘Now and Then’ mobile game developed by a doctoral student from University of North Texas for the iConference. Using the Aurasma app, the game offers a treasure hunt of sight in the downtown Fort Worth as well as in the cultural district and the cowtown Stockyards. Good stuff, nice idea, and what at great way to help conference participants explore the local surroundings and the latest in information techonology all at once. Except I couldn’t get the darn thing to work. Whereas QR codes are easily readable by the mobile camera scanner, the object recognition software of the Aurasma scanner seemingly required a lot of precision to work. In other words, you had to get the excact same image as the Aura showed, which was tricky, to put it mlldly. Obviously, the person building the treasure hunt was taller than me, meaning that I had to hold up my camera in some pretty akward angles, and still then, I could only get half of them to work. Meaning that I missed out on the clues and couldn’t follow the treasure hunt. And if you did get the ‘aura’, you had to keep the camera in the same position in order to keep the connection, or the content would disappear again, which was particularly annoying with videos. Now, I quite like the idea behind this, that you can add layers of content onto places without using QR codes or similar, heck, I might even experiment with creating my own auras to get a better understanding of how it works. But my initial expereince is that the technology does not yet hold up to this idea, and the result is very frustrating. My guess is that users less dedicated than me would have given up much sooner. So technology may have come a long way, but we’re not there yet. So, in the spirit of the wild west, it’s on the next frontier! Just tucked into a new book; Creativity and Technology – Social Media, Mobiles and Museums (Katz et al, eds., MuseumsEtc., 2011), heading straight for Nancy Proctor’s chapter on mobile social media in the museum as distributed network. Proctor opens the chapter with the statement that it’s not about the technology – its about the content. Old school audio guides were (are!) not herding the audience to follow a certain pattern and look at certain artworks for a prescribes length og time because of broadcast technology, but because the content instructed them to do so. “But imagine, for a moment, that the content asked visitors to spend a couple of minutes looking around the gallery, then to choose a favorite artwork and describe it to a companion” Proctor suggests, “Using the same, archaic broadcast tour technology, we would have seen a very different experience played out in the museum.” (Proctor ibid, 24). Hold that thought! Although I find this thinking sympathetic – if also bringing to mind the potential discrepancy between curatorial and mediation perspectives and aims – I couldn’t help wandering what would happen if we could actually have all our questions answered as they occur to os. (I’m not claiming that this would be Proctor’s intention; this is just the question that occured to me as i was reading her article). Imagine a futuristic mediation device, say a pair of spectacles, that not only noticed where you looked by deducted from your brainwaves what you were thinking and promptly offered you the relevant information. (Coming to a museum near you, best get a patent on that ASAP). Or even walking the gallery with the curator, ready to answer your questions as they came. Although we would certainly become more knowledgable, and in light of this added knowledge, inspired to go deeper in our explorations, we would also have had our original train of thought disturbed. And perhaps the best part of that original question was not the answer to the question itself. Perhaps concrete questions, when unanswered, become the gateway to more abstract ponderings and reflections, reflections that make for a much more enlightening experience at the end of the day, that are, perhaps, the whole point of cultural experiences. But maybe we just feel lost, or perhaps that lost train of thought just ends up sending us looking for the café, because that’s something nice and concrete that we know what to do with. It could go either way. So sometimes we need the answers, and making the relevant information available at the relevant place and time can only be a good thing. But perhaps this explains in part why we don’t go for the self-guided tours: That reflection takes time and cannot always be guided – we simply need time and mental space to absorb the experience as we experience it, and peace of mind to let it stew, to allow for that reflection to happen. Proctor goes on to describe the quirks and qualities of soundtrack and soundbites, including video content, and lays out the possibilities, strengths and weaknesses of a variety of mobile platforms. This leads to an argument for dropping the concept of the multi-platform museum as the ideal for making content available on a multitude of devices. Multi-platform, Proctor argues, implies publishing to many platforms from a single sontent source, which, at a glance, looks like great economy of scale. However, content developed for one platform rarely translates well to another – think pamphlet text used on websites or even recorded and turned into a podcast. Neither does one size fits all when it comes to audience needs and interests. Instead, what is needed is a more flexible apporach to content and experience development. This thinking is based on the principle that the best way to learn is to teach. Which is probably right. But there’s still something about this voxpop ideal that I think becomes problematic when it comes to realisation. Because who wants to be taught? I mean, it may make a lot of sense in both engagement and learning terms for me to share my views, knowledge and experience of culture – but will it also enrich the cultural experience and outcome for the next visitor, be it onsite or online? Again, there can be conflict between educational and curatorial aims, and I’m not quite sure which site I’m on as a visitor. Still, exploring the potential and downfalls of this kind of approach to museum mediation is excactly what my project is about, so in this research context, problematic translates as interesting. In an epilogue to her article, Proctor provides a list of top tips for building a long tail mobile social media program, which benefits both visitors and the museum, and includes references to good examples and useful how-to articles. Like this presentation by Titus Bicknell on how to build your own mobile tour in WordPress in only an hour on handheldconference.com – great ressource!